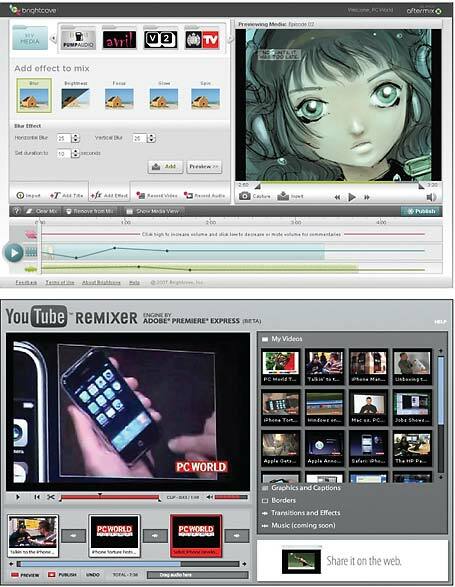 Edits, transitions, effects: Taking cues from Jumpcut's Editor, Brightcove's Aftermix (top) and YouTube's Remixer tools let you edit video online. YouTube, now owned by Google, may still be the 800-pound gorilla of video sharing sites, but an impressive number of rivals--some merely clones, others offering unique twists--are nipping at its heels. We whittled down an initial list of 50 contending services to 17 topflight sites we tested to determine the single best place to share your videos online. Blip.tv's video quality and functionality made it our overall Best Bet, but each free service has strengths in areas that others may not. In addition, we list the top ten sites in our Top 10 Video Sharing Sites chart. For our rankings, we also took into account policies on shared advertising revenue, potential audience size, the entire upload experience, and the design of each embedded player, including the intrusiveness of any advertising, watermarks, and other nonvideo elements. In addition, we considered social-networking options, the ability to make videos private, and other attributes. Each site that we tested--those in our top 10, plus AOL Uncut Video Beta, Crackle (previously Grouper), Dailymotion, Facebook, Google Video, Metacafe, and Yahoo Video--will let you upload a variety of video types, but the only format supported across the board is QuickTime. Most sites don't limit video length or the number of videos you can upload, but many restrict file sizes to 100MB. Consequently, we used the same 1-minute-long, 95.5MB QuickTime (MPEG-4) test file with Apple Lossless stereo audio to test each site. To gauge video quality and audio, we incorporated shots from past PC World Videos and Test Center footage from the Panasonic PV-GS500, our current MiniDV Camcorder Best Buy, in our 720-by-480-resolution video.